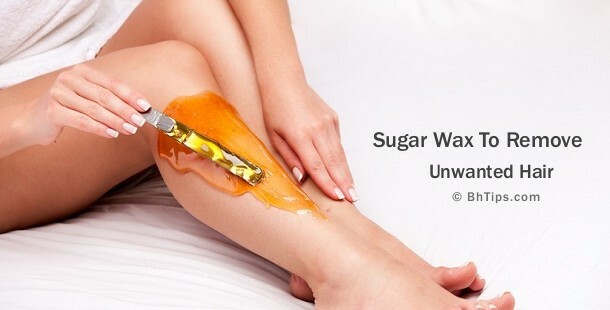 Sugaring or Sugar wax is one of the best and most effective way to get rid of unwanted hair. Sugar wax is always preferred to chemical wax or other hard wax techniques because sugar paste never adheres to live skin, but only to dead skin cells and hair. The sugar paste permeates deep into the hair follicle, effectively removing the hair and the inner root sheath along with dead skin cells and results in hair free smooth and glowing skin. On the other hand, chemical wax may adhere to live skin cells along with hair and may leave behind skin scars and burning sensation. Chemical wax is more painful and less gentler to skin and that's why less recommended as compared to sugar wax. (i) Mix them well and then boil in a frying pan on medium flame. (ii) Keep stirring the mixture until all the sugar has melted, and you have a thick brown liquid. (iii) Let the paste slightly cool down before applying on skin surface. (iv) Now apply this with a plastic knife or wooden stick in the direction of hair growth. (v) Use muslin or cotton strips to absorb the wax. Press them down firmly and then pull off in the opposite direction of hair growth. (vi) Repeat it again until all the unwanted hair are completely removed from the roots. This wax can be use to remove hairs on arms, legs, underarms and upper lips. (i) Avoid Hot sugar waxing because it may damage your skin. Wax must not be too hot nor too cold. Use slightly warm sugar wax. (ii) Never wax on sunburn, wounded or damaged skin. (iii) For waxing hair must not be too long nor too short. A good length is 4-6mm. The waxing product can't adhere well on too short hair. Too long hair hurts too much when it is waxed. (iv) Before waxing wash the areas with warm water to open skin pores and after waxing wash skin with ice cold water to close skin pores.